Learning, playing and learning through play are complex issues that we have tried to simplify and explain with this film. It shows learning taking place through self chosen, enjoyable activities. By following one boy for a year (from his third to his fourth birthday) we see clearly how his development and learning are progressed through his rich play experiences. He is seen playing at home indoors and out and sometimes at his playgroup. He plays on his own, with friends and with his mum. His mum is seen supporting his play. Key aspects of learning through play are highlighted and explained with a friendly and personal commentary. 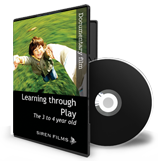 The film shows how, through careful observation of children at play, you can gain a deeper understanding of their interests and how they learn best and that this is invaluable for planning and assessment. The accompanying notes (21 pages) include background information, points of interest and questions and discussion topics for each section.